Fylde cruised through to a semi-final date with Fleetwood Town in the Lancashire FA Senior Cup after a convincing victory at Oldham. One of five triallists on show for the League One side opened the scoring midway through the first half before Callum Chettle levelled with a stunning strike. George Hassall put the Coasters ahead after the break before Henry Jones converted from the spot. Dave Challinor made 11 changes to the side that lost at Woking in the National League on Saturday, with a welcome return for James Hardy and Henry Jones after injury. There was a cagey start at Chapel Road, Oldham’s training ground, with little in the way of goalmouth activity. Josh Ezewele got into a dangerous position but his low cross was well intercepted by former Fylde loanee George Edmundson. Serhat Tasdemir was looking lively early on and tricked his way into the box before seeing his cross-shot claimed by Latics stopper Zeus de la Paz. 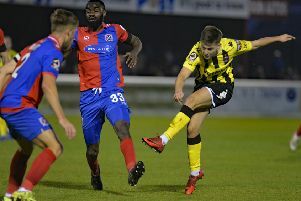 Another flowing moves saw Ezewele cross low to the back post but 19-year-old lone-striker Hassall couldn’t make contact. Shortly before the 20- minute mark, a goalmouth scramble followed Hardy’s corner, with both Hassall and Chettle having efforts blocked inside the box. Completely against the run of play, Oldham took the lead with their first chance as a cross from the left was tucked away at the back post. Fylde should have been level seconds later, when a triallist of their own went through one-on-one only to see his low strike well saved. However, Challinor’s side didn’t have to wait long to draw level. Chettle advanced towards the edge of the box, and as runners bombed either side of him he took his time and picked out the far corner with a sublime curling effort from 20 yards. Midfielder Mohamed Maouche went for the spectacular himself but his shot fizzed wide of the Fylde goal. Chettle was close to a second as his vicious first-time strike was palmed away. Young Fylde keeper Elliott Wynne was called into action with a five save when Courtney Duffus powered through for Oldham. Defender Edmundson should have scored shortly after the break, although his jump and attempted header from a corner lacked conviction, while Jones should have done better at the other end from Tasdemir’s through ball. The Welsh starlet made amends moments later when his delightful free-kick to the back post was expertly headed back across goal and into the far corner by Hassall. Jones’ marked his return with a goal on the hour, when he sent the goalkeeper the wrong way from the penalty spot. The third goal knocked the wind out of Oldham and a wild swipe from Maouche was as much as they could muster. Fylde could have added a furth when Tasdemir cut in from the left, beat his man and fired narrowly over from the edge of the area. Young substitute Jack Kay almost provided the moment of the match when he nicked the ball off the last defender, beat him again and rounded the keeper before hitting a post with the goal gaping. Challinor said: “It’s was a brilliant run-out. I wanted the lads who haven’t been involved as much to give me selection problems. “I wanted them to make sure I couldn’t leave them out at the weekend and in fairness they have done that.They were all brilliant. “Everyone will take something from the game, whether it be the young lads being involved in the senior set-up or the experienced lads getting a run-out. “The performance on a horrible pitch was outstanding. We scored three goals and it should have been more. These games are all about attitude and every single one of them impressed me. “Oldham created very little against us, and even when we did go behind we showed even more spirit and determination. AFC Fylde: Wynne, Ezewele, Grand, J. Taylor, Trialist, Chettle, Trialist, Jones (B. Jones 81), Hardy (Kay 62), Tasdemir, Hassall (Gray 62). Subs not used: Allinson, Pope.